In May of 2014, I published my analysis of the social network of world foreign ministries (MFAs) on twitter. Through this analysis, I hoped to investigate the degree to which MFAs follow one another on social media. I was also interested in learning which world MFAs are most followed by their peers? Which MFAs are avid followers of other MFAs and which MFAs serve as important hubs of information? What I discovered was that the world’s MFAs comprise a dense social network as they routinely follow their peers on twitter. I assumed that one MFA would follow another given a desire to gather important information with regard to foreign policy initiatives and agendas. For instance, by following Israel’s MFA, the US State Department can anticipate new Israeli initiatives vis-a-vis the Arab world. 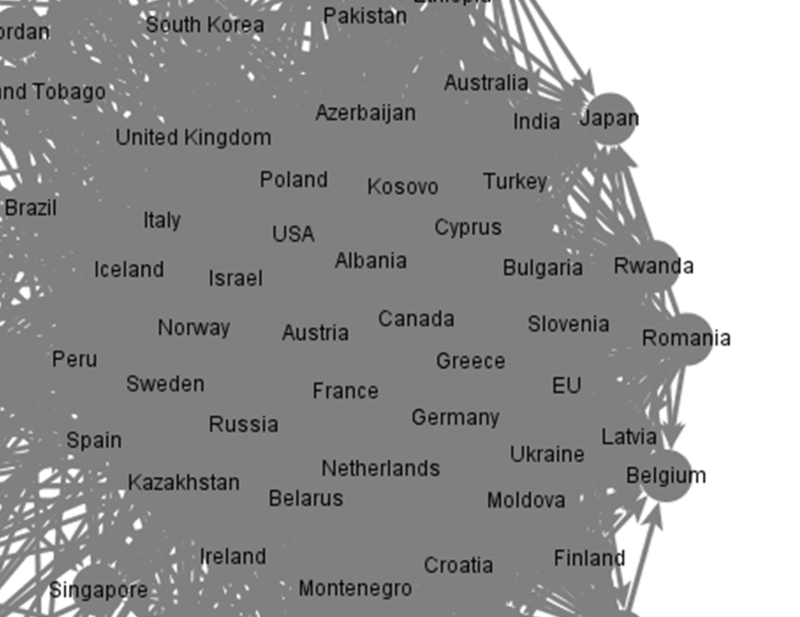 Since March, I have expanded my study of digital diplomacy social networks (e.g., social network of the UN, social network of Foreign Ministers, social network of World Leaders). This week, I decided to re-analyze the MFA social network. I wanted to learn if the ranking of various MFAs in this network had changed (e.g., an MFA moves from being the second most followed MFA to first). I also wanted to learn if the social network of MFAs is now denser as MFAs increasingly follow their peers online. Using the same sample of 77 MFAs from 2014, I re-analyzed the social network of MFAs which can be seen in the image below. Note that the densest area of the network, or its core, includes both the most popular ministries in this network as well as those ministries that are avid followers of their peers on twitter. In order to analyze this social network I calculated three parameters. The first is the in-degree parameter which measures the popularity of each MFA in the network. This is an important parameter as the more popular an MFA, the greater its ability to disseminate information to the global diplomatic milieu. 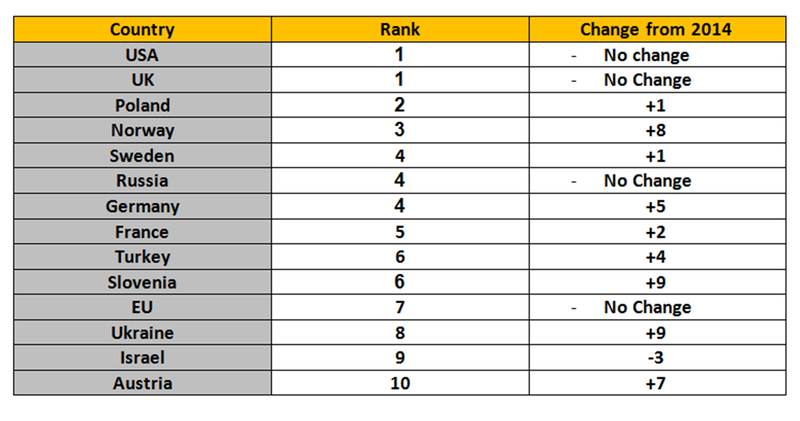 The table below presents the 10 most popular MFAs in this network. Likewise, it details changes in the ranking of each MFA (note that some MFAs are tied. For instance USA and UK are tied in first place). As can be seen in this table, Norway’s MFA has surged ahead over the past year coming in at third place as opposed to its 2014 ranking of 11. Slovenia and Austria have also made impressive strides this year in addition to Ukraine which climbed nine places. This could be a result of both its growing use of twitter and its newsworthiness. The image below exhibits the location of the most popular MFAs in the MFA social network. As can be seen in the table above, many nations have forged ahead this year in the out degree parameter. Peru has climbed seven places and now receives the highest out degree score of all 77 MFAs. Kazakhstan has climbed 12 places, Spain has climbed 25 places (!) and once again Austria has also made it to the top 10 MFAs in this parameter. Russia, which has been the focus of much attention this past year, seems to have become an even more avid follower of its peers from around the world. On the other hand, Kosovo, Sweden and Israel all received lower scores this year when compared to their 2014 ranking. The image below exhibits the location of the 10 MFAs that are most avid followers of their peers on twitter. Finally, I calculated the betweenness parameter. This parameter identifies which MFAs serve as important hubs of information as they connect Ministries that do not follow one another directly. The table below presents the 10 MFAs that received the highest betweenness scores. These are also identified in the social network in the image that follows. As can be seen in the table above, Norway continues its up-ward climb in this parameter as well and is now the most central hub of information in the entire MFA social network. As opposed to the out-degree parameter, the betweenness parameter shows relatively small changes in ranking. For instance, both the US and Israel which topped this chart last year have dropped four places this year. Interestingly, Russia is one of the only countries to have received similar, if not better, scores in 2015 when compared to 2014. Quite a fete. There are only four countries that received top 10 scores in all three parameters. 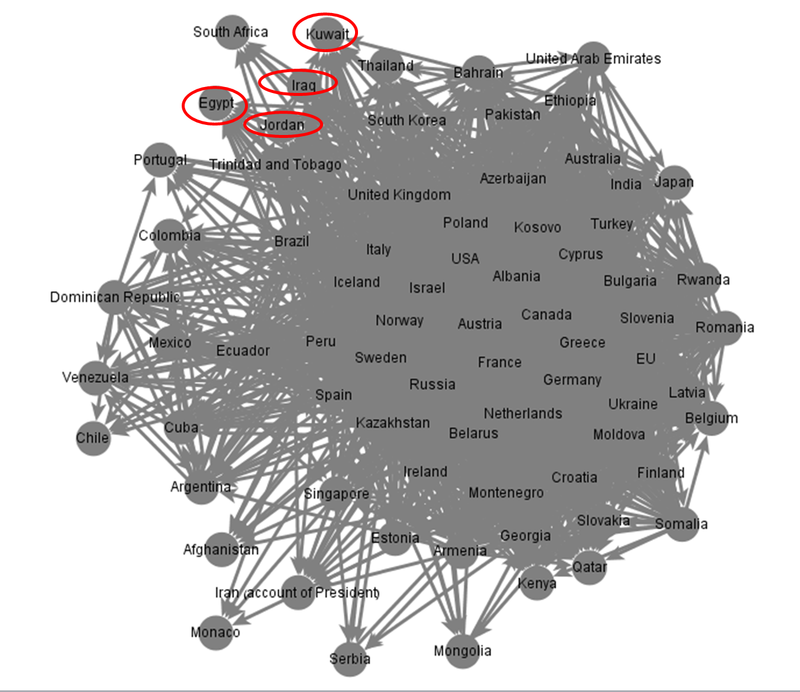 The 2015 digital diplomacy A-Team is: Norway, Sweden, Russia and Israel. It should be noted that Russia, Israel and Sweden were also part of the 2014 A-Team. Thus these three nations continue to solidify their role as leaders in digital diplomacy. There were two more findings that warrant attention. First, as was the case in 2014, Arab and Latin/ S. American countries seem to create isolated clusters located in the periphery of the MFA social network. This could be a result of the fact that they do not tweet in English but rather in Spanish, Portuguese or Arabic. Despite the civil unrest in the Middle East, and the coalition war against ISIS, most Arab countries have yet to attract a large number of MFA followers. The location of these countries may be seen in the images below. Secondly, this year’s network is much denser than the 2014 one. In 2014, the average MFA was followed by 14 of its peers. In 2015, the average MFA is followed by 28 of its peers. Thus, it seems that the global diplomatic community is becoming increasingly more connected. Posted in Uncategorized and tagged Digital Diplomacy, Foreign Ministries, MFA, Network Analysis, social network, twiplomacy, Twitter. Bookmark the permalink. 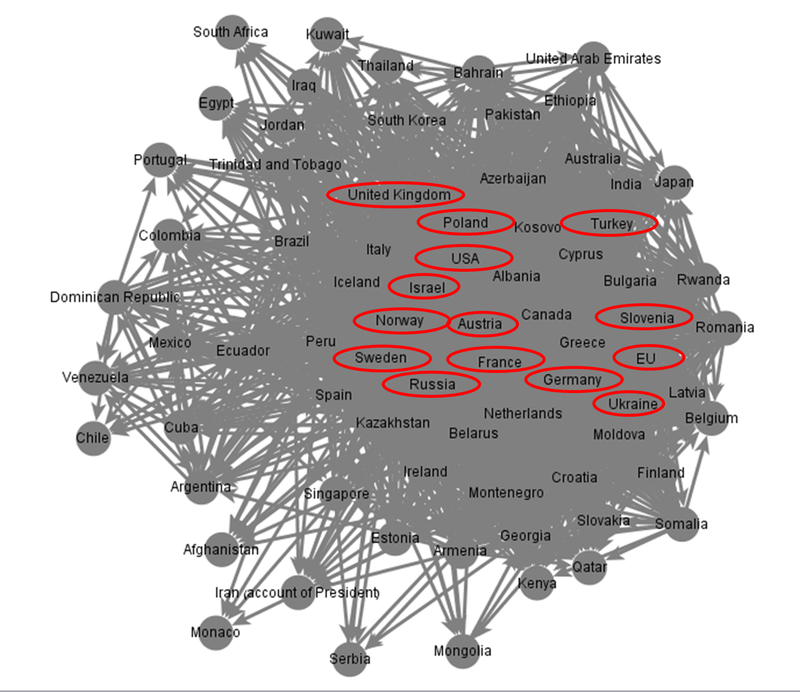 In Light of Digital Diplomacy- Are We in Need of New Communication Models?